The WPCM League Tables Widget is used to display a table of club standings in any widget area according to the options you choose in the widget settings. Enter the title of your widget (eg. League Table). Leave blank to have no title. Choose which League Table to display. 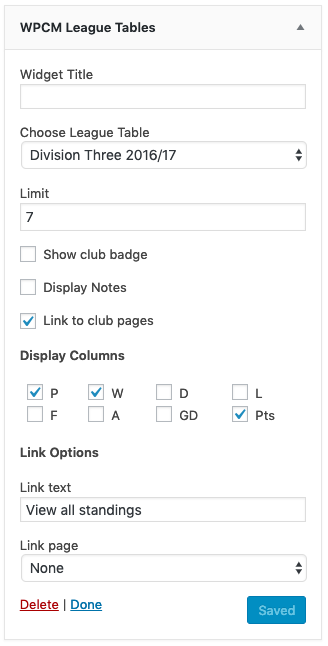 Set a limit to the number of clubs to display. In Club Mode, if a limit is set your club will always be centred, with opponent clubs either side. Check the box to display each clubs badge in your standings table. Choose whether to display notes associated with the chosen League Table. Check the box to link each club to their respective club profile page. Choose which columns to display in your standings widget. The text to display if Link Page is set. Setting a Link Page will display a link under the standings table.